On a cold, blustery March day, we took a ride with CBF's fearless female captains in honor of Women's History Month. CBF Maryland environmental educators and captains Amanda Colianni, Tiffany Granberg, and Ronnie Anderson on Meredith Creek near Annapolis, Maryland. Friday afternoon. Gray, cold, rainy. Not the most appetizing day to get out on the water, but it's not stopping Captain Tiffany Granberg, Captain Amanda Colianni, and Captain Veronica "Ronnie" Anderson. The dedicated trio of CBF's Maryland female captains is headed out of Meredith Creek near Annapolis, Maryland, and I'm along for the ride. 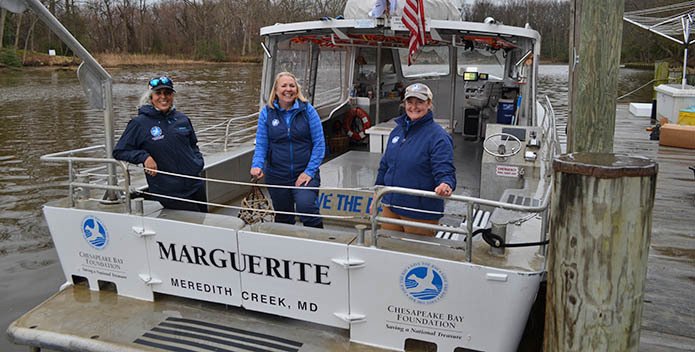 The 42-foot, aluminum hull jet boat, the Marguerite, slices through choppy water as Captain Granberg steers with ease around bends, dodging shallow water pockets, until we arrive at the mouth of Meredith Creek into the great, wide open of the Chesapeake Bay. For nearly 50 years now, CBF has provided meaningful outdoor experiences to more than a million students all across the watershed. In fact, in 2018 alone, environmental educators like Granberg, Anderson, and Colianni exposed roughly 33,600 students and teachers to the Bay, its rivers and streams, teaching them about the Chesapeake ecosystem and the value of clean water. These outdoor classrooms are instumental in educating and inspiring the next generation of Bay stewards—and there's nothing more fulfilling for Granberg, Anderson, and Colianni. Against the comforting sound and smell of a hard-working diesel engine, and in between gusts of wind, together the environmental educators talk about why they do what they do. What drew you to the Chesapeake and to CBF? So I grew up on an island [Staten Island]. But I never had a connection to the water, couldn't even name most of the rivers or bodies of water. Had no idea about watersheds or anything like that. Going away to college to the University of Maryland, taking a natural history of the Chesapeake Bay course, getting out in the field with that course, and learning about the Bay and its rivers while also seeing how people in Maryland were connected to their waterways was something that really drew me to the area. I just love that kids around here grow up eating crabs and playing on the rivers and they know the names of the rivers. There's a connection here to the water that I never experienced where I grew up. And here at CBF, I’ve been doing this for 21 years now, and I absolutely love it. No two days are the same. There's always something new. I actually went on a trip with my environmental class back in high school to CBF's Karen Noonan Center. It was just absolutely magical. And I had a sort of long and shifting path back to CBF. I had already been environmentally inclined and then realized that it's much better to be focused on a smaller area. I can't save the world, but I'm going to focus on this one thing. 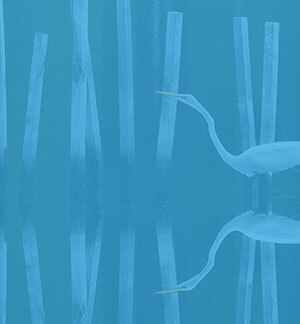 The Chesapeake Bay Foundation does a really good job of that—this is our watershed, this is what we have responsibility for and this is where we actually can enact change in. And I love that. The reason why I got into boating—it's a great platform for education. It’s an experience that can turn kids on that have never had that kind of interaction with the outdoors just because it’s a contained platform and it’s mobile, so it creates this really unique classroom in a way that nothing else can. And when you spend a little bit of time early in the day gauging the students' knowledge of the Bay, developing from there what the themes for the day will be, and how we can best reach the students—it all magically comes together, and you have these little lightbulb moments. And the Chesapeake Bay Foundation is so firmly anchored in this area—that's really special. How hard was it to become a captain? It's a lot of time . . . definitely a gauntlet. You have to be very committed. Absolutely. It takes being on a boat for enough time that you feel like OK, I'm ready for that next step. And then you really have to buckle down and study. It’s a lot of work. To get your license, you have to have 360 days of sea time. And then you can take a two-week long class before you take the test. It’s a four-part exam . . . all-day long, pretty extensive. But it’s a very proud accomplishment when you pass. Were there a lot of other women in your classes studying to be captains? I was in a class of 10, and I was the only woman. I had about 15, and I was the only female. I did my exam online, so I don’t know. But in the commercial world for sure, it’s still rare to find female captains. In my 20 something years at CBF, there have been about three or four female captains. And right now at CBF there's three of us just here in Maryland, so that's been really exciting. I had a lot of really great mentors here who encouraged me to do it. Really wonderful CBF captains over the years, and I've learned a tremendous amount from them. There are extraordinary responsibilities and stresses when out on the water. What keeps you coming back day after day? More and more we’re finding kids who when we ask what do you know about the Chesapeake Bay, they have answers. It's becoming a more well-known issue, and what we're doing is actually working. Like seeing an otter swim by the other day and thinking hey it's clean enough that we have these cool things living here again! One of the things that I absolutely love . . . often we get to be the first exposure for some students and even adults as well—the first time on a boat; the first time seeing an osprey; or the first time seeing an eagle. I just love that. There's an experience of taking a boat out on a piece of water that you see from bridges or roads all the time that just absolutely changes it for you and can really light a fire the way that no other experience can. Even if you have a group of kids who are initially so freaked out that half of them don’t even want to step onto a boat, getting out on the Bay can have such a huge impact on them.